We know Doi Saket through Beanspire, an young Thai exporter and specialty coffee development company. We work with a cooperative at Doi Saket that is headed by a progressive village head, Mr. Opp. He wants to see the quality of Doi Saket’s coffee improve, and understands the importance of connecting his village members to the specialty market as well as we do. In the first season, we sold just one lot of washed coffee. But this year, Beanspire and Mr. Opp cooperated very intensively to create what we think are the most impressive processing experiments that come from the country at this moment. Try them out for yourself, because of their rarity we are offering them by the kilo this year! Our Thai value chain is organised to a large degree by Beanspire. Not only did they acquire a dry mill, they also take care of the entire overseas shipping process for us. Arabica: (Mostly) Typica, some Catimor. 1,300 – 1,500 meters above sea level. Note that at 19 degrees north of the equator, this elevation is really high for coffee (e.g. Colombia Narino is 1 degree north, Nicaragua is about 13 degrees north.) Coffee cannot grow in Thailand above 1550m. Doi Saket is one of the oldest coffee growing regions in Thailand and there are still a lot of heirloom Typica plants left. Part of Thailand's King’s opium crop substitution program. 2018: Most Saket lots sold out before even arriving to Europe. Created an experimental semi washed lot that should combine the best traits of the washed and honey processes. the price you pay for Saket (semi washed) p/kg. the price Beanspire pays farmers in Doi Saket cash in hand for their parchment coffee (translated into a p/kg green price). This price is much higher than our African or South American offerings, showing the relatively high development level of Thailand, and the strength of its local coffee market. dry milling costs accrued by Beanspire. sea freight from Bangkok to Rotterdam + clearance, local transport and storage. Beanspire margin and expense coverage. Costs include coordinating the wet- and dry milling process, export and sea freight. This Side Up compensation for spending time and resources importing this coffee. 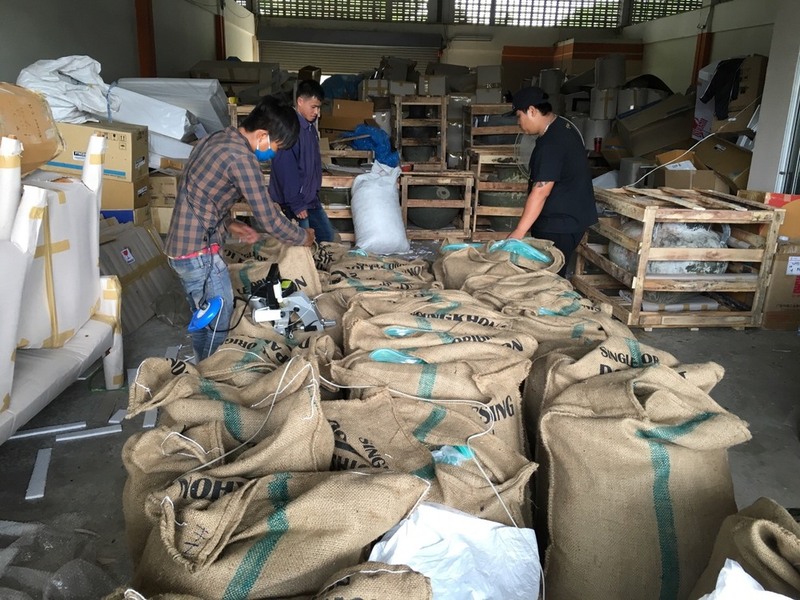 Our work includes building relationships with shipping and warehousing partners, managing export, import and shipping bureaucracy, Q grading, sampling and jointly promoting this coffee with Beanspire Coffee and Doi Saket coop members. We loved how the Saket turned out most in our Washed 1 profile. Beautiful bright tones, even and smooth texture with the characteristic spices and toffee sweetness fully developed. We only tweaked the cooling in the profile below. For the natural, use Sebastiaan Geistdorfer's profile and cut off if it passes 24% DTR. You may use these images freely to promote Saket among your customers. Please credit Beanspire if you do so. We communicate with Fuadi at Beanspire for all our practical dealings, but you are welcome to contact Mr Opp of the Doi Saket cooperative directly. Thailand is not traditionally known as a specialty coffee producing country, yet it has been producing Arabica coffee since the early 80's. It started off as part of the Thai King’s opium eradication project. Because Arabica coffee thrives in a similar condition as opium, it was selected as a substituting crop against the cultivation of the illicit plant. Today, Thailand produces about 8,000 tons of Arabica coffee, mainly in the mountainous north of the country. On top of that, Thailand produces about ten times as much Robusta coffee, making it the third largest coffee producer in Asia. Thai specialty coffee is rarely seen in the top specialty roaster segment abroad. The main reasons for this are twofold. Thailand is a middle-income country and has a thriving local coffee market. That means relatively high production costs for a relatively undemanding coffee market. Having said this, a strong specialty coffee segment is emerging. At least on the consumer side, the Third Wave is quite well established, with artisan roasters and cafés in Bangkok and Chang Mai. These roasters have recently begun to develop and buy local coffees too, not in the least because of import tariffs on foreign coffees. However, this scene is still very small and for now, hardly creates enough incentives for farmers to improve the quality of their coffee to specialty grade. So even though they have been doing a great job at pushing the limits of Thai coffee, the specialty coffee scene would be greatly aided with more specialty coffee knowledge and global integration. This Side Up sees an important opportunity to showcase Thai coffee to the world's specialty coffee scene, not despite but precisely because of the higher production prices and living standards. Exposure to specialty coffee phenomenon in relatively stable economies like Costa Rica and Panama has made them leaders in innovation, labour and environmental protection - and equally importantly, has made coffee farming, even on a micro-mill scale, lucrative for the next generation. On a larger scale, the gigantic coffee traders will eventually run out of cheap places to source bad coffee, and specialty coffee will surely continue to grow and disperse. These factors, in our view, mean that equality, quality focus and integration will slowly but inevitably become the future of the entire coffee producing world. As a global society, we should be getting used to consumer prices that reflect a higher level of country development and social justice. We therefore have the ambitious goal to demonstrate, however small we are, that by kickstarting an increase in exposure and quality investment, stable Thailand and its young generation of coffee entrepreneurs could enter into a race to the top, become a country known internationally for its superb coffees - and in time set an example for the entire Asian region. 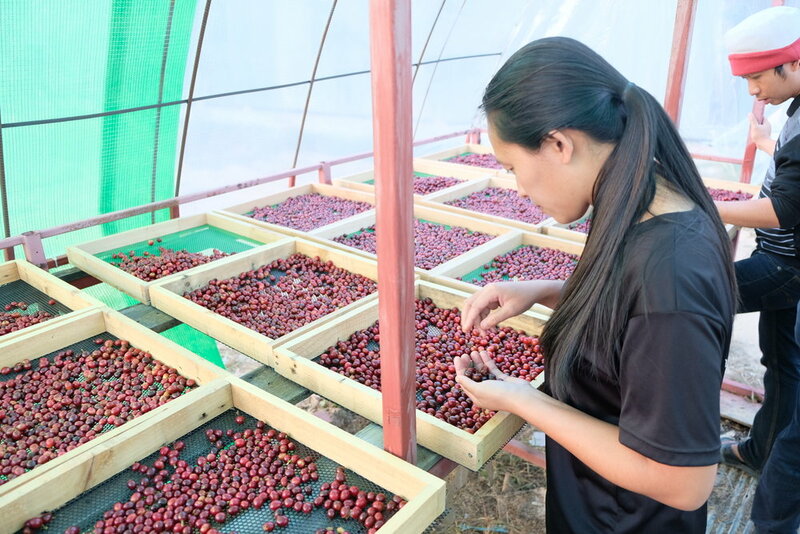 Enter Beanspire, an exporting company made up of a group of young Thai specialty coffee enthusiasts who exist to provide a window for Thai specialty coffee smallholder farmers to the world. Their mission is much like that of This Side Up - but since they are mainly based in origin, our combined value was apparent from the start. Fuadi Pitsuwan was introduced to me by a mutual friend and tea expert, Janjarang Pat Kijitkhun and we quickly became sparring partners about the possibilities of Thai coffee in the European market. We decided to do a pilot project with the 2016 harvest aimed at attracting the interest not only adventurous roasters, but of other, larger importers as well. Doi Saket is the oldest coffee growing area in Thailand, located in Chiang Mai province. The first few trees of Arabica coffee that were part of the opium replacement program of the Thai King were tested here. As a result, heirloom varietals, particularly Typica, are still commonplace in many old farms. 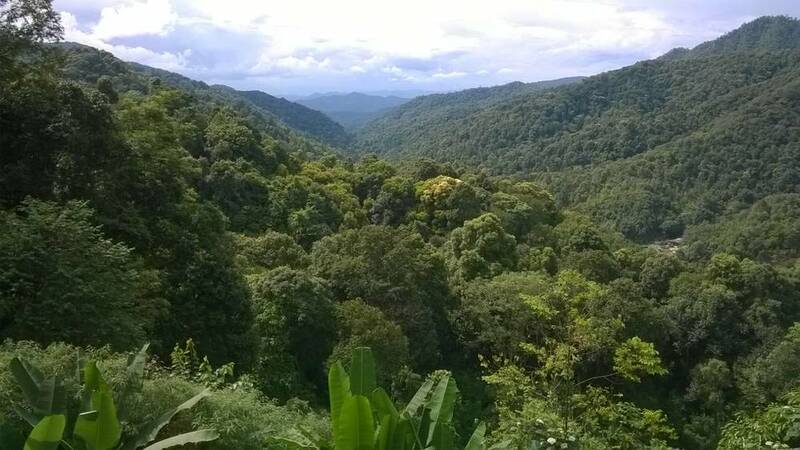 The area is also a strict protected forest because it is next to a big city, Chiang Mai, meaning the national forest department and the police can reach it easier. Doi Saket is the epitome of shade grown coffee farms. 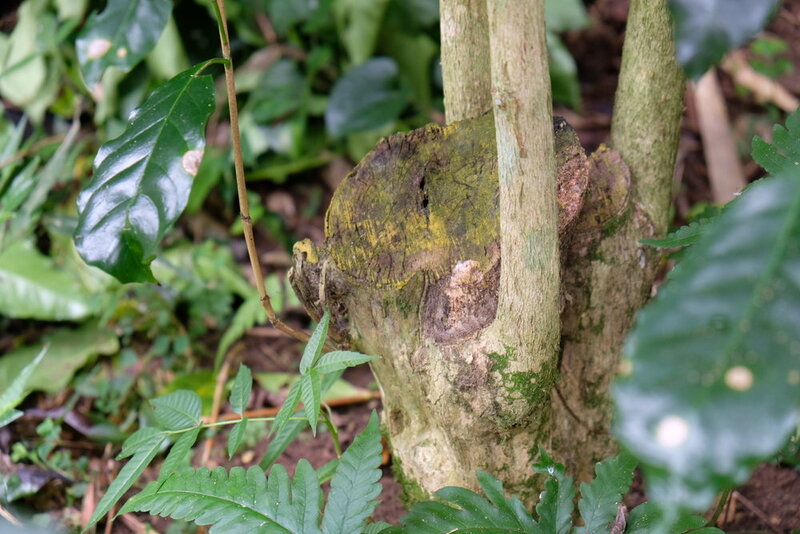 Typica trees are grown under a forest with many micro mills each producing about one ton of green beans per year. Unlike Doi Pangkhon (another coffee This Side Up is offering from Thailand) whose inhabitants are Akha hill tribe, Doi Saket’s villagers are of Thai descent, meaning they typically integrated better with the Thai society and the Thai state has been better at providing them with social welfares. Doi Saket’s farmers grow coffee from the altitude of 1000-1500 masl, but Beanspire selected only coffee beans from 1300+ masl for our lot. Coffee at Doi Saket is processed using a traditional fully washed method. Coffee cherries are pulped at micro wet mills at each farming family’s home and then dried on raised bamboo beds. The parchment is then hulled, size sorted, density sorted and hand sorted. In the next seasons, we will be experimenting with other processing techniques to explore the limits of Thai coffee. Through our partnership with Beanspire Coffee, a group of young Thai specialty coffee believers who have been working with farmers in Thailand to improve the quality of coffee, This Side Up works with a cooperative at Doi Saket that is headed by a progressive village head, Mr. Opp, who wants to see the quality of Doi Saket’s coffee improves. Mr. Opp hopes Doi Saket’s coffee will be roasted by those who appreciate the hard work of his village members. Mr. Opp knows that connecting his village members to the specialty market will help improve the standards of the coffee from his village. This is both Beanspire’s and This Side Up’s first season of working with Mr. Opp and we have high hopes for the future coffee from Doi Saket! 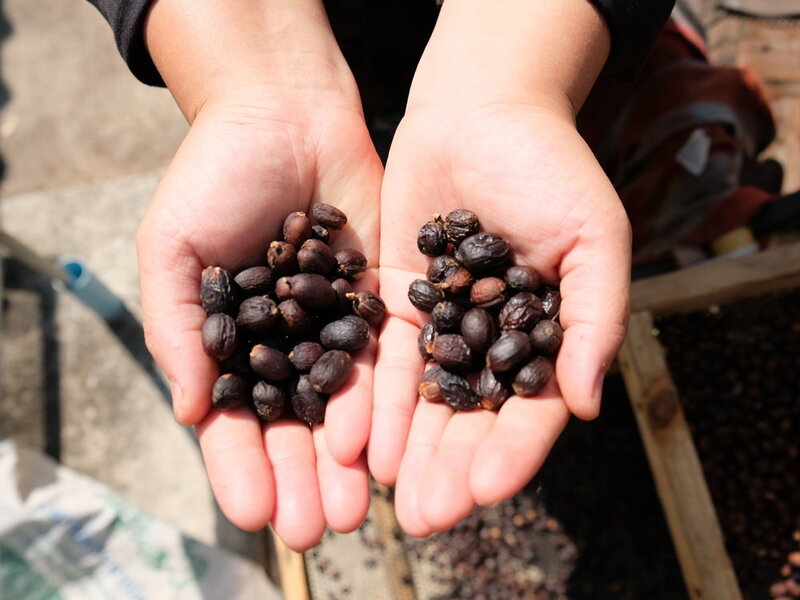 Beanspire and Doi Saket worked together very intensively to create some incredible microlots which we decided to sell by the kilo because they are so rare. Here are the details of the processing of the fully washed, honey and natural lots that we imported for the 2017 season. Fully washed lot: made up of 5 small scale farmers. Fermented for 24 hours and then soaked for 24 hours more. The coffee is dried on bamboo-raised beds for 14-21 days. The parchment went through multiple sorting machines (size and density) and lastly hand-sorted. Honey washed experiment: sorted again after selective picking. pulped and dry fermented for 12 hours to partially remove the mucilage before drying the parchment on raised beds. Removed the mucilage for about 50%, hence much of the mucilage still remained, producing parchment that is red in color. The parchment is dried very thin and raked by hand frequently to prevent further fermentation. Parchment was sorted to take out any defect during the drying process as well. Natural experiment: First, ripe cherries picked in the morning and began the processing right away to avoid unwanted fermentation. 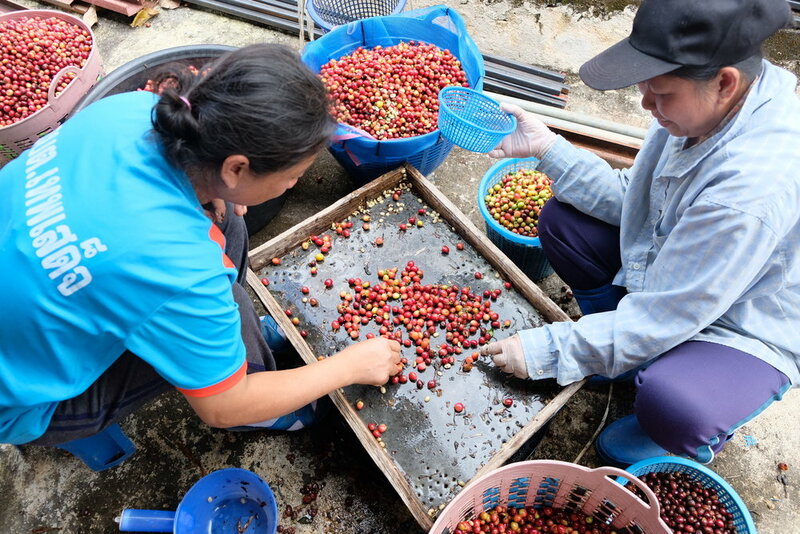 Second, hand-sorted only coffee cherries to select only perfectly ripe ones. Third, the cherries were samples to make sure that their Brix values are higher than 22. Fourth, cherries floated to remove any defective coffee beans. Fifth, laid the cherries on raised beds in a single layer and minimised the cherries touching each other to ensure even moisture and lack of unwanted fermentation. Sixth, dried the coffee in a green house in a controlled environment. The drying was carefully monitored over 3 weeks and we continued to pick out defective cherries until the moisture of the cherries reached 10%. Next to the successful processing experiments of last year, Beanspire and Doi Saket cooperated on a new experimental semi washed process: They partially fermented the coffee for 12 hours, cleaned the wet parchment, but left a trace of mucilage on the parchment with hope that it would produce a clean cup and good acidity like the washed process, but also add interesting characteristics, particularly the sweetness and body, which are more common in honey processed coffee than washed. In other words, it's a half-way process between a fully washed and a honey. After the parchment is dried on raised beds to a desired moisture level for 21-25 days, we then cured the coffee for two more months before milling and the green is further rested for a few months until it is exported.